گودرزیان, فرشاد, عموشاهی, حسین. (1397). بررسی کمانش ورق‌های مرکب لایه‌ای متعامد تحت شرایط حرارتی و رطوبتی با اعمال آسیب جداشدگی لایه‌ها به روش نوار محدود. 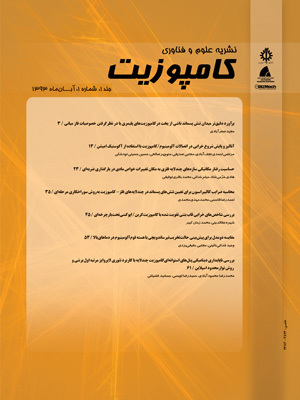 علوم و فناوری کامپوزیت, 5(3), 437-450. فرشاد گودرزیان; حسین عموشاهی. "بررسی کمانش ورق‌های مرکب لایه‌ای متعامد تحت شرایط حرارتی و رطوبتی با اعمال آسیب جداشدگی لایه‌ها به روش نوار محدود". علوم و فناوری کامپوزیت, 5, 3, 1397, 437-450. گودرزیان, فرشاد, عموشاهی, حسین. (1397). 'بررسی کمانش ورق‌های مرکب لایه‌ای متعامد تحت شرایط حرارتی و رطوبتی با اعمال آسیب جداشدگی لایه‌ها به روش نوار محدود', علوم و فناوری کامپوزیت, 5(3), pp. 437-450. گودرزیان, فرشاد, عموشاهی, حسین. بررسی کمانش ورق‌های مرکب لایه‌ای متعامد تحت شرایط حرارتی و رطوبتی با اعمال آسیب جداشدگی لایه‌ها به روش نوار محدود. علوم و فناوری کامپوزیت, 1397; 5(3): 437-450. در این مقاله تأثیر تغییرات شرایط محیطی از جمله درجه حرارت و رطوبت محیط بر بار کمانشی ورق‌های لایه‌ای مورد بررسی قرار گرفته است. بدین منظور با در نظر گرفتن اثرات تغییر مشخصات مصالح تشکیل دهنده ورق در اثر دما و رطوبت بر ظرفیت کمانش ورق در شرایط تکیه‌ گاهی مختلف و بارگذاری دو محوره ارزیابی شده است. همچنین تاثیر آسیب جدا شدگی لایه‌ها بر ظرفیت کمانش ورق در حالت‌های مختلف بررسی شده است. روش مورد استفاده جهت محاسبه بار بحرانی ورق‌ها روش نوار محدود بوده که تئوری برشی مرتبه اول بر آن اعمال شده است. در روش نوار محدود از توابع شکل مثلثاتی در جهت طولی نوار و توابع شکل هرمیتی در جهت عرضی برای جابجایی‌های برون صفحه و توابع شکل خطی برای جابجایی‌های درون صفحه استفاده شده است. برای مدل سازی جدا شدگی لایه‌ها، محل و ابعاد جداشدگی با جدا سازی المان‌ها و بازیابی مجدد ماتریس‌های سختی استاندارد، هندسی، نیرویی و جرمی تعیین شده و اثر آن‌ها بر میزان بار بحرانی ورق لایه‌ای در حالت‌های گوناگون ارزیابی شده است. نتایج حاصله بیانگر میزان تغییرات بار بحرانی در دما و رطوبت‌های مختلف و همچنین میزان تاثیر جدا شدگی لایه‌ها می‌باشد. In this paper the effect of hygrothermal conditions such as temperature and moisture on buckling of composite laminated plates is investigated. For this purpose, the effect of changing in material characteristics with changing in temperature and moisture on buckling capacity of plates with different end conditions and biaxial loading is evaluated. In addition, the effect of delamination of layers on buckling load of plate is studied in different situations. The finite strip method is used in present paper to calculate the critical load of plate considering first shear order deformation theory. In finite strip formulation for evaluating the displacement field of each strip, the trigonometric shape functions is used in longitudinal direction and the Hermitian and linear shape function is used for out of plate and in plane transverse direction, respectively. The place and dimension of delaminating layers is modeled by separating the adjacent elements and reconstructing the standard, geometric, force and mass matrices, so, the critical load of laminated plates is calculated in different situation. The results show that the amount of changing in critical load of laminated plate for different temperatures, moistures and delamination of layers. Amoushahi, H. and Azhari, M., "Buckling of Composite FRP Structural Plates Using the Complex Finite Strip Method" Composite structures, Vol. 90, pp. 92-99, 2009. Lee, D., "The Local Buckling Coefficient for Orthotropic Structural Sections" Aeronautic J, Vol 82, pp. 313-320, 1978. Lee, D., "Some Observation on the Local Instability of Orthotropic Structural Sections" Aeronautic J, Vol 83, pp. 110-114, 1979. Lee, D. and Hewson, P., "The Use of Fiber-Reinforced Plastics in Thin-Walled Structures" Stability problems in engineering structures and composites, pp. 23-25, 1978. Banks, W. and Rhodes, J., "The Post-Buckling Behavior of Composite Box Sections" Proceedings of the international conference on composite structures, pp. 402-414, 1981. Banks, W. and Rhodes, J., "The Instability of Composite Channel Sections" Proceedings of the international conference on composite structures, pp. 442-452, 1983. Lopatin, A. and Morozov, E., "Buckling of a Uniformly Compressed Rectangular SSCF Composite Sandwich Plate" Composite Structures, Vol. 105, pp. 108-115, 2013. Della, C. and Shu, D., "Vibration of Delaminated Composite Plates" Appl Mech, Vol. 60, pp. 1–20, 2007. Tenek, L. Henneke, E. and Gunzburger, M., "Vibration of Delaminated Composite Plates and Some Applications to Non-Destructive Testing" Compos Struct, Vol 23, pp.253–262. Ju, J. Lee, H. and Lee, K., "Finite Element Analysis of Free Vibration of Delaminated Composite Plates" Compos Eng, Vol. 5(2), pp. 195–209, 1995. Champanelli, R. and Engblom, J., "The Effect of Delaminations in Graphite/PEEK Composite Plates on Modal Dynamic Characteristics" Compos Struct, Vol. 31, pp. 195–202, 1995. Hou, J. and Jeronimidis, G., "Vibration of Delaminated Thin Composite Plates" J Compos Part-A, Vol. 30, pp. 989-995, 1999. Shiau, L. and Zeng, J., "Free Vibration of Rectangular Plate with Delamination" Journal of Mechanics, Vol. 26, pp. 87-93, 2010. Kumar, S. Cinefra, M. and Carrera, M., "Finite Element Analysis of Free Vibration of The Delaminated Composite Plate With Variable Kinematic Multilayered Plate Elements" Composites Part B, Vol. 66, pp. 453–465, 2014. Alnefaie, K., "Finite Element Modeling of Composite Plates With Internal Delamination" Composite Structures, Vol. 90, pp. 21–27, 2009. Parhi, P. Bhattacharyya, S. and Sinha, P., "Finite Element Dynamic Analysis of Laminated Composite Plates with Multipile Delaminations" Journal of reinforced plastics and composites, Vol. 19, 2000. Amoushahi H., “Time Depended Deformation and Buckling of Viscoelastic Thick Plates by a Fully Discretized Finite Strip Method Using Third Order Shear Deformation Theory” European Journal of Mechanics A/Solids, Vol.68, pp. 38-52, 2018. Amoushahi H., “Time Depended Deformation of Viscoelastic Thick Plates by a Fully Discretized Finite Strip Method Using Higher Order Shear Deformation Theory”, Accepted in Civil Engineering Sharif Journal, 2017 (In Persian). Parhi, P. Bhattacharyya, S. and Sinha, P., "Hygrothermal Effects on the Dynamic Behavior of Multiple Delaminated Composite Plates and Shells" Journal of Sound and vibration, Vol. 248(2), pp. 195-214, 2001. Panda, H. Sahu, S. and Parhi, P., "Hygrothermal Effects on Free Vibration of Delaminated Woven Fiber Composite Plates" Composite Structures, Vol. 96, pp. 502-513, 2013. Sairam, K. and Sinha, P., "Hygrothermal Effects on the Free Vibration of Laminated Composite Plates" Journal of Sound and vibration, Vol. 158, pp. 133-148, 1992.